The Wood Royal Commission into police corruption moved the drugs problem from Kings Cross out to Cabramatta, then the NSW Parliamentary inquiry into the Cabramatta's drugs problem, evidenced by police in fighting at Cabramatta and districts, then moved the drugs problem out to South West Sydney. Now, the growing case file of Task Force Gain was revealed as 40 police officers raided a home in Merrylands. The operation in a quiet, residential street was the third major raid since the squad was formed two weeks ago. Officers, armed with search warrants, terrorised the house at dawn, [allegedly], hunting for firearms and information on last May's murder of Mathew Hughan at Telopea. During yesterday's raid, masked and helmeted members of the State Protection Group leapt from an armoured car and made six adults and two young boys leave the home at gunpoint. The residents, still in their pyjamas, were told to lie on the front lawn. Police were still questioning four of the adults - two young women and two young men - late yesterday. They had dug up part of the backyard of the home, which was also searched with metal detectors and drug and gun sniffer dogs. Police would not say last night if any evidence relating to the Hughan murder had been found. In other words no evidence was found. When police find evidence they show graphic pictures of that evidence. In this case the raid appears to be random and these people appear to have been innocently terrorised. But sources say there is an element of police corruption as well in that these criminals had the green light from police but over-stepped the mark in a turf war thinking they could disturb the whole community. These three murders are in addition to the task force's investigation into four deaths linked to a feud between rival crime gangs in the Bankstown area. Police said the Hughan, Mansour and Collins murders were not linked to the Bankstown inquiry. Task Force Gain is also targeting an unrelated feud between rival drug-dealing and gun distribution gangs in the Fairfield district in which two men have been killed and three wounded since December, Superintendent Henney said. The disappearance of a man in suspicious circumstances from Sydney's south west this year is also on Gain's case list. Police have not revealed the identity of the missing man. Superintendent Henney said Mr Mansour, an alleged drug dealer from Lakemba, died on June 12, 2001 from multiple stab wounds he suffered in an attack on the Central Coast. At 3pm that day, he was found close to death and bleeding from multiple stab wounds on the doorstep of a Long Jetty medical centre. Mr Collins was found shot dead in the bedroom of his Albion Street, Roselands unit on May 28, 2001. SHOULD POLICE RANDOMLY RAID RESIDENTS HOUSES? SHOULD POLICE HAVE EVIDENCE BEFORE RAIDING RESIDENTS HOUSES? 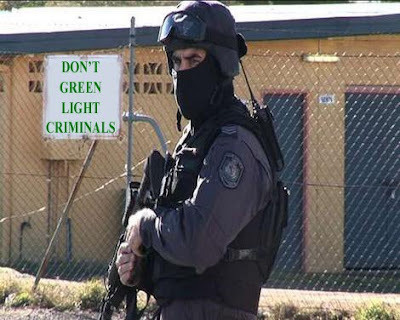 SHOULD AND INDEPENDENT BODY LOOK INTO POLICE GIVING CRIMMINALS THE GREEN LIGHT? SHOULD INNOCENT PEOPLE BE TERRORISED DURING RAIDS BY POLICE?